SAP Business One allows storing items according to bin locations. 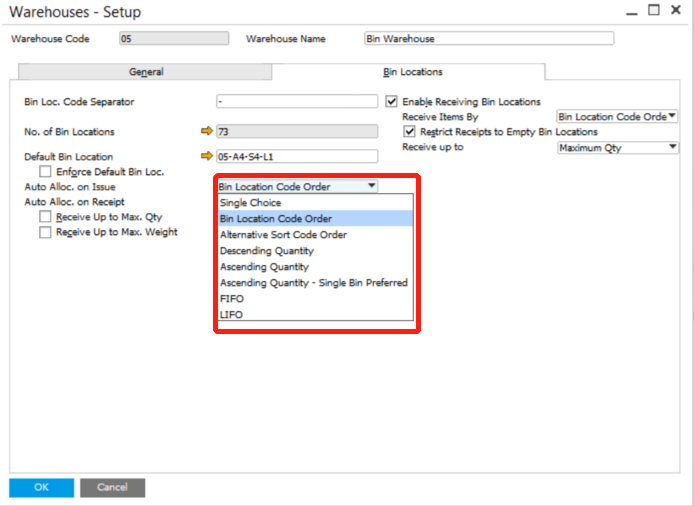 When setting up bin locations, you need to determine between several working methods. Go to Administration > Setup > Inventory > Warehouses. Here users can setup automatic allocation on issue and on receipt. The Single Choice method means that Automatic allocation only occurs when there is only one possible allocation option. The Bin Location Code Order method means that items are allocated according to the alphanumeric order of the bin location codes. The Alternative Sort Code Order method means that items are allocated according to the alphanumeric order of the Alternative Sort codes. The Descending Quantity method means that items are allocated according to the descending bin location quantities. The Ascending Quantity method means that items are allocated according to the ascending bin location quantities. If you are interested in how to export documents into Excel, PDF, a text file, Word, or other versions, please visit Export in SAP Business One.